Most jobs require more than one ladder. With the Transforma, you get up to 24 different ladders in one portable, compact, easy-to-use unit. 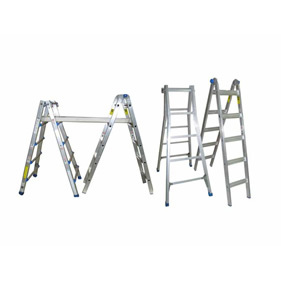 Get up close to your work in tricky areas other ladders just can't reach. The secret to the Transforma™ is its ability to telescope – unlock the hinge locks, stop at any rung and you get a different size ladder. Adjust to almost to a 90-degree angle so you can get right up close to your work and into those tight spots safely. •	Use on stairs and slopes •	Super-strong, robust construction •	Inner & outer side rails made from high grade aluminum •	Inner & outer units made from slip-resistant aluminum •	Storage footprint of just 1.4m We believe the Transforma is the safest, strongest, most versatile, functional, slip-resistant aluminium ladder in the world.